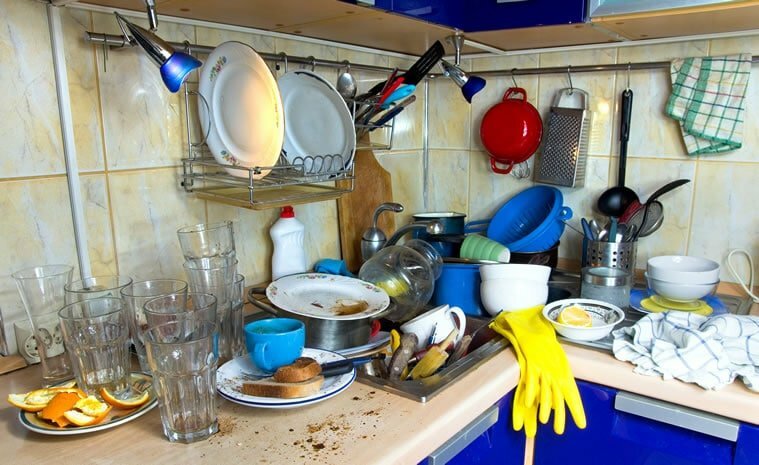 Home » Strategies » Better food and fewer dirty dishes? Yes, please! Cooking creates dishes, and there’s really no way around that fact — but there’s a really simple way to drastically reduce the number of dishes you dirty while making food, which of course means less time spent washing dishes. That simple thing is… learning to cook. If I lost you there, stay with me. Learning to be a better cook will of course yield more delicious food, but it also makes you a more efficient cook. Efficiency allows you to move through your kitchen in a way that uses less space, less time, and, thankfully, makes less of a mess. That last part is where the dishes come in. 1. Pre-read recipes to learn what ingredients will be mixed together and when. If you read that a bunch of items will be combined in a bowl without any pre-preparation, then you’re welcome to measure all of those ingredients into that one big bowl instead of a bunch of smaller bowls. 2. Pay attention to the bowl, pot, and pan sizes the recipe calls for. If a recipe calls for a medium-sized pan, don’t try to be clever and squeeze it into a small pot. Same goes for bowls. What usually happens is that you’ll add your ingredients, figure out it’s not going to work, and then have to trade up a size… which creates another dirty dish, but also wastes time as well. A smart cook thinks ahead to make sure they’ve got the right vessel ahead of time. If you cook with meat, you’re probably aware that bacterial contamination is a problem. If you’re carelessly throwing spoons and spatulas all over your kitchen, and some of them end up in a puddle of chicken juice on the counter, guess what? 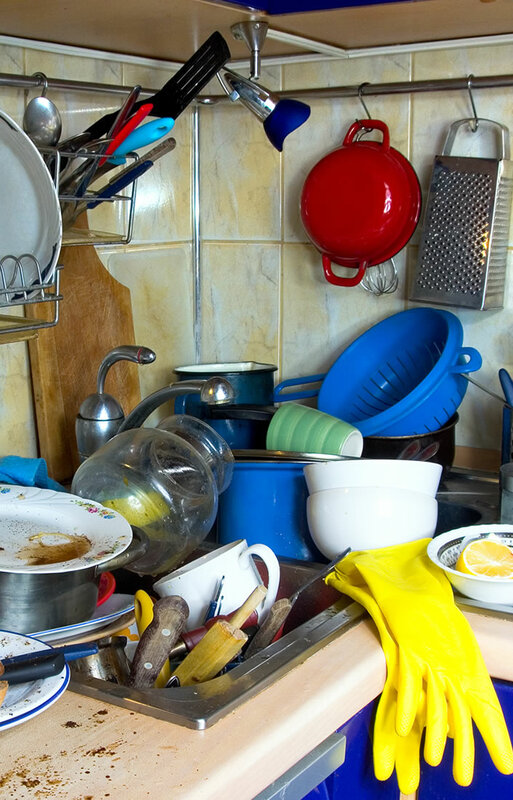 You just bought yourself either more dirty dishes or a potential case of food poisoning. Being aware of what cooking tools come in contact with raw meat can greatly reduce the amount of dishes you have to do… and also reduce your risk of making someone sick. Becoming a better, more efficient cook doesn’t take nearly as much time and effort as you might think. I spend almost all of my time teaching people how to cook, so I’ve got this system DOWN. 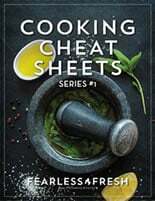 Fearless Fresh Cooking Cheat Sheets come in both physical laminated pages, and a digital version. Or, you can get everything for a 15% discount when you grab the Cheat Sheets Bundle. And to celebrate the end of October Unprocessed, get an additional 5% off! Use this coupon code: octoberunprocessed5.